When I was offered the chance to review Snapgammon, I thought, “Okay, it’s basically backgammon so at least I’ll be good at it. But it has cows. And cards that give you special powers. And crazy dice for added chaos. Sign me up!” I was intrigued and hoped that this would elevate backgammon to the heights I always wanted it to reach. So did it, or am I still looking for more? Read on to find out. 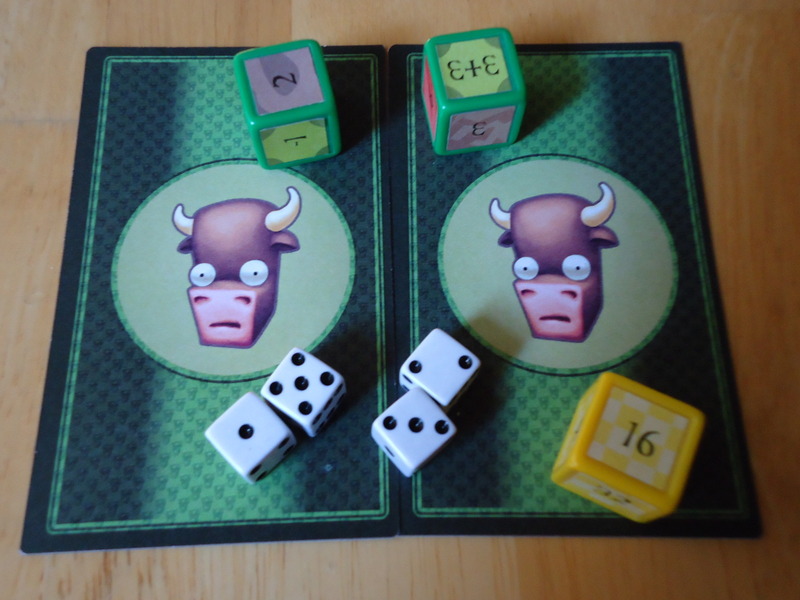 On your turn, you roll two standard dice to determine how far your cow(s) can move. You must use each die separately, so if you roll a three and a six you can move one cow three spaces and another cow six spaces. You can use both dice to move the same cow, but you have to make two separate moves, not one move for the combined distance. If you roll doubles, you play each die twice for a total of four moves. Once all of your cows reach your home station, you can begin moving them onto the train. A cow can only board the train if you roll the exact number of spaces needed to reach the train, with one exception: The cow that’s furthest from the train can board if you roll a number higher than the remaining distance. So if your furthest cow is four spaces from the train and you roll a six, that cow can board the train. If any cows get moved out of your home station (except for those on the train), you must stop boarding until all cows are back in the home station. Advanced backgammon players will already be familiar with the doubling cube that is included with Snapgammon. This comes into play if you are playing several games in a row and competing for points. If you think you are winning the game you can, on your turn, rotate the doubling cube so that it shows the next highest number and hand it to your opponent. Your opponent has the option to immediately resign the game. If he does, your double is nullified but you still win the game. If he does not forfeit, play continues but now the doubling cube is in his possession and he may choose to double you. If the doubling cube is used during the game, the winner’s final points are doubled by the last value shown on the cube. So far, it plays pretty much like standard backgammon, right? Where things get interesting is the addition of cards that let you break the rules. Each player has a hand of three cards. You can only play a card on your turn and a card can only be played once, after which it is discarded. Each card has two effects on it (called “Good Powers” and “Brutal Powers”) and you can choose only one effect to play. 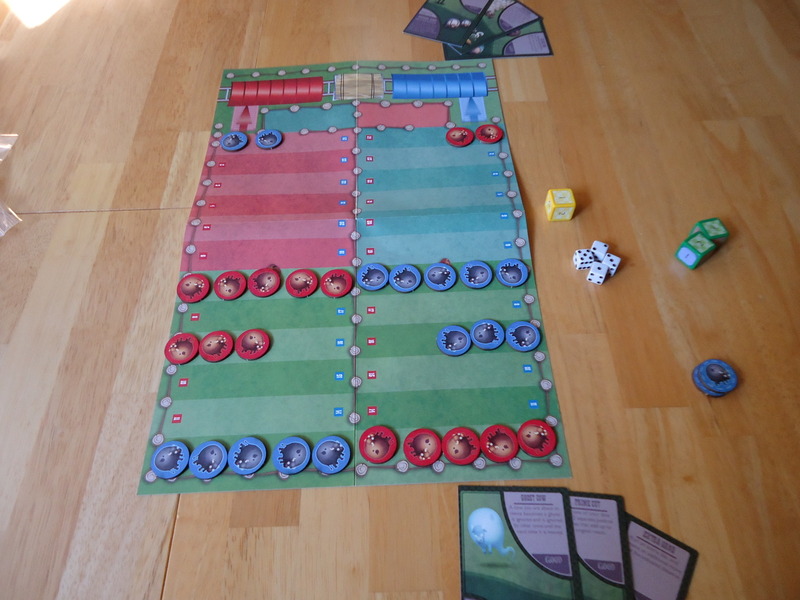 Good powers generally help just the player using them, such as turning your cow into a ghost cow that cannot be hit or blocked by your opponent, or adding an extra die to your roll and movement. Brutal powers generally allow you to mess with your opponent, such as making your opponents move backwards one space, or swapping one of your cows with your opponent’s cow to gain position. How and when the game ends depends on how you’re playing. Snapgammon can be played either as a single game or as a match where the scores from individual games (players determine the number of games they wish to play) are added up. If playing just a single game, the winner is the first player to get all of their cows onto the train. Points are not calculated if playing a single game. If you’re playing multiple games, a win is normally worth one point. 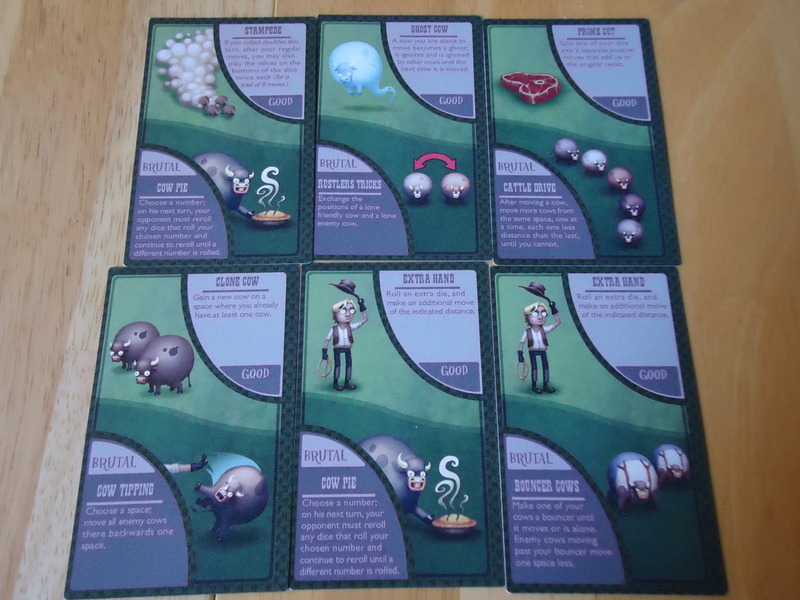 However, if you win and your opponent has not boarded any cows, you win a “gammon” which is worth two points. 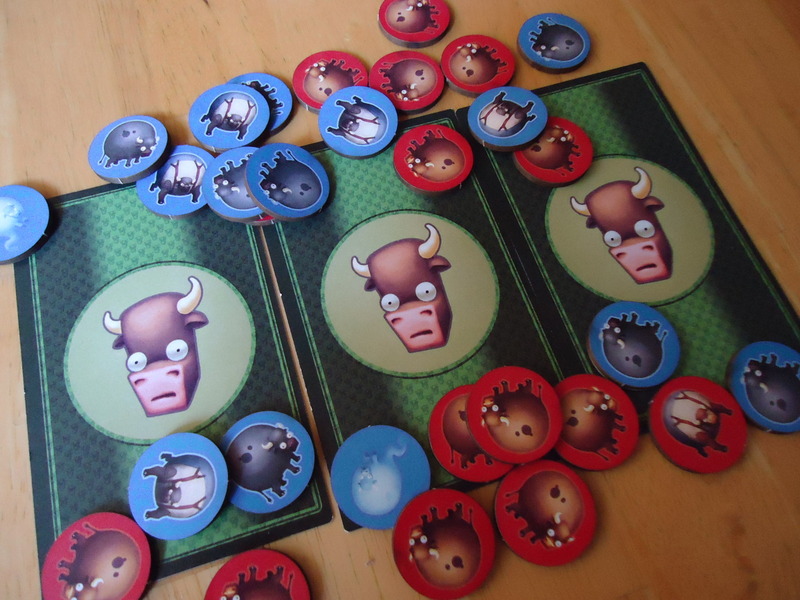 If you win and your opponent has not boarded any cows and he has at least one cow in either your home station or in the cowpen, then you win a “snap” which is worth three points. The winner’s score is then multiplied by the value on the doubling cube (if it was used). Each player’s winning points are added up at the end of the match and the winner is the person with the most points. Bovine Beauty or Cud Crud? I enjoyed Snapgammon. It managed to give the game just enough “more” to make backgammon really appealing to me. The cows, the colors, and the cute art on the cards and tokens satisfied my need for games that go beyond black and white pieces on a board. Snapgammon isn’t a full blown, Ameritrash, theme-dripping game by any means, but what it does add makes it more palatable to those of us who roll our eyes at most abstracts. The cards are by far the best addition. The powers can completely change the flow of the game and they provide an extra layer of decisions to make. Sometimes a card will have two great powers on it, but you can only use one before you have to discard the card. So which one will you use and which will you let go? When do you deploy your powers? Do you use them early, or hope that they will bail you out of a late game jam? It’s all much more exciting than basic backgammon, not to mention more strategic. The cards also level the playing field, particularly for kids, non-backgammon players, or people who aren’t great at abstract games. Since you never know when a card will be played or which power will be used, it’s harder to successfully deploy a long term strategy. I’ve known backgammon players who attack the game like chess, with a pre-determined set of moves and gambits designed to destroy their opponents within five moves. While this is a fine way to play the game, it can lead to total frustration for a new player. The cards take away that sort of play to a degree. You can have a fine strategy laid out, but a card played at the wrong time can smash your plans to bits. Some people will hate this element of unpredictability. For them, I recommend sticking to basic backgammon. For those who like to be in a game to the very end, however, I would go with Snapgammon. A card played at the right time can save you from some prior sub-optimal moves. Because it’s basically backgammon, Snapgammon is a great game for non-gamers. Many people already know how to play backgammon and the extra rules that Snapgammon adds aren’t difficult to grasp. The added mechanics don’t add much time to the game, either, with most games finishing in 15-20 minutes. You can reel off a decent match consisting of several games in under an hour. All of this makes it a great game to bring out when non-gaming parents or friends come over. It’s also very kid-friendly and may be a great way to introduce kids to backgammon. They’ll likely be more impressed with the cows and the extra powers than with a basic backgammon set. On a related note, be aware that Snapgammon can be used as a regular backgammon set. Just don’t use the cards or special rules and you’re playing basic backgammon. If you’re looking to acquire a backgammon set for your household, you might want to consider getting just this game and letting it do double duty for you rather than owning both. The game includes two variants for added replayability. “Crazy Dice” replaces the standard dice with the provided crazy dice. These dice have values not included on the regular dice including -1 (move backward one space), 8 (move eight spaces forward), and 3+3 (make two separate moves of three spaces each). You cannot roll a four with the Crazy Dice and the rules for rolling doubles are changed. The “Smashgammon” variant allows you to hit groups of enemy cows on a single space instead of hitting just one cow. These variants are a fun way to change up the basic play and keep things from getting too stale. Snapgammon also seems ripe for other house-made variants such as playing only the Brutal or Good Powers from the cards (the latter should make the game even more kid and newbie friendly and also help to avoid the hurt feelings that can come from some of the Brutal Power cards). I could only find two potential negatives in Snapgammon. First, the components were a bit of a disappointment. The board is a fold up paper board and it’s difficult to get it to lay flat, although it is attractive. The tokens are cardboard. Their art is cute and they are functional, but nothing stellar. The cards and dice are well done. The biggest disappointment, however, is the box. The game comes in a generic cardboard box with a decorative sleeve that slides over it. This sleeve is tight fitting and isn’t very durable. After just a few plays, it’s beginning to tear from sliding it on and off the box. The day isn’t far off when I’ll have to cut it up and simply glue the images onto the box. If you are expecting the elegance and durability of a classic backgammon set with plastic, bakelite, or wooden pieces and a hard board, you’ll be disappointed. For a retail price of $25.99, the components seemed a bit lackluster. You can often find a good-quality backgammon set for under $15, so this seemed a bit steep by comparison. On the plus side, it is smaller and more portable than most classic backgammon sets so you can travel with it. The box sleeve isn’t going to hold up over repeated plays. Second, the game is still backgammon. Even though there are additional mechanics and a cute theme, the basic game is still an abstract. It adds just enough theme and choices to backgammon to make it more interesting than the standard version, but if you don’t already like backgammon this isn’t going to convert you. I would choose this over basic backgammon any day, but I already had some affinity for the game in the first place. If I were a backgammon hater, or a hater of abstracts in general, this wouldn’t have been enough to change my mind. 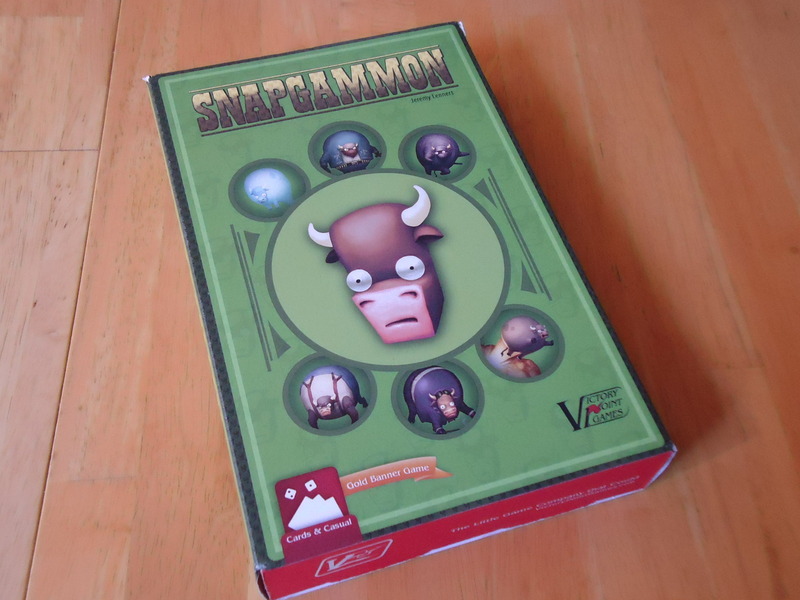 All in all, Snapgammon is a satisfying little game. It plays fast, offers some interesting decisions and a bit of strategy, and wraps it all up in a cute, inoffensive theme that’s great for a variety of audiences. If you love backgammon or have frequent visitors who do, this is a must-add to your collection. 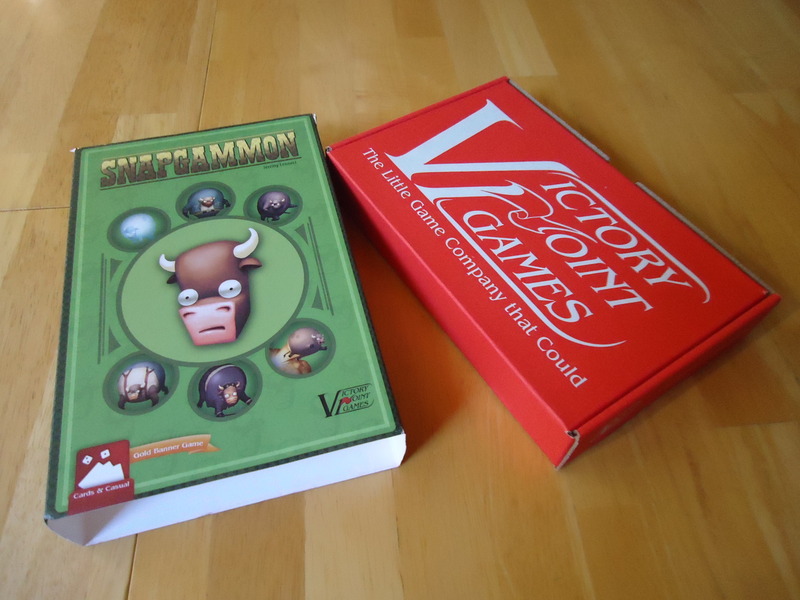 iSlaytheDragon would like to thank Victory Point Games for providing us with a copy of Snapgammon. Very fast play and setup times. Variant rules and 'crazy dice' included for extra replayability. Anyone who knows backgammon will have no trouble learning this. The cards and their choices of powers provide a fun twist and some interesting decisions. While it adds some mechanics to standard backgammon, it doesn't really increase the fiddliness, time, or complexity. More appealing to kids than basic backgammon. Can do double duty as a standard backgammon set. The components, while functional, are a bit flimsy. Does not change the game of backgammon enough to appeal to backgammon-haters.